Another question for Alex... I was thinking about this today.... So I export this hair for Genesis... will it conform to Genesis and follow most of the morphs and heights that are dialed in?? I tried using Garibaldi Express but it only comes with 3 female hair styles...no male. I'm not the kind of user that likes to style my own characters hair, so if there aren't any included I probably won't use it. The fact that you're gong to provide lots of example styles will blow Garibaldi out of the water. Can't wait! I'm willing to provide lot of hair styles, because I do understand that several users won't be willing to bother styling or creating hair from scratch, but rather start from a base model, tweak and modify it, do some experiments and render. Besides Genesis, I was thinking to provide fur styles for the MilBig Cat and Dog, and add those little by little: as I and other folks have the time, it will be possible to upload and share those on a library section on LAMH web site. When you say export you mean export to RenderMan? If so the answer is yes. Because if you export to .obj (which is plain geometry), obviously those won't be automatically following the underlying model. Even if, and forgive me because I certainly do not know Studio as well as many other of you, perhaps in Studio you may convert the hair object to a conforming figure, and then it will follow and adapt to the model? Going to eye this project with great interest for sure! Not worked directly with Renderman. So if not exported as an obj but to Renderman ... well I'm not sure about the process of this... I think I have your PDF around here somewhere but at this point no idea where too look for it to read up on this process. Strange request, but I just couldn't help myself! Do you think the head-dress/mask from Princess Mononoke - http://payload55.cargocollective.com/1/5/160870/3405142/Mononoke1.jpg - could be replicated using the Look At My Hair plugin? Not for the mask itself, obviously, but for the rest of it? I was talking to my brother about the film, and the fact there's going to be a new fur plug in for Daz, and it got me excited! I'm so looking forward to this product for Daz, especially as someone who uses it to create an art for a specific rp character of mine, who wears furs. As a Reality user, I can't use the furify shaders, and they don't look very good anyway, sadly. Just be careful when setting a OBJ hair file to follow or conform to a figure in Studio. 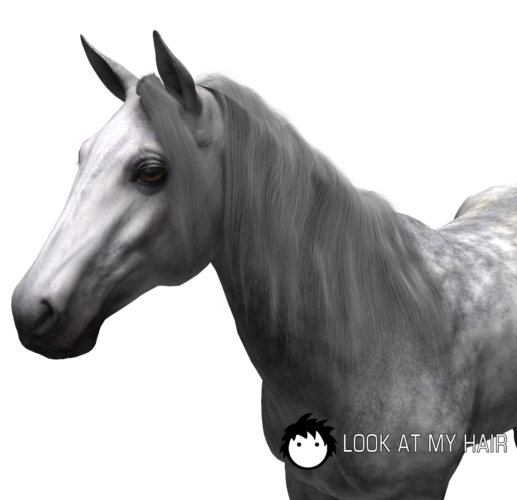 A high Poly count hair model will bring your system to a slowdown when dialing up morphs or shapes. Anything above 300k polycount might be an issue on most rigs. towards the end he shows off the exported hair following the moves and morph changes of Genesis. ie. he he started with a fully dialed in Gorilla, slid back the morph, and then re-synced the hair in lamh. true info - you really only need to resync if you want to continue editing the hair - the renderman curves will follow the figure in daz when you pose/morph on its own. Okay, That's a downer. I thought the hair when made was just another hair prop. Like the other Fiber Hairs out right now. say you export some renderman curves hair - you can use that hair on any genesis character. you'll just have to use the lamh interface to sync it with the figure instead of it moving on its own in daz workspace. Yea, fibermesh. Mec4D (Cath) has a couple. Not sure how she exported and conformed it to Genesis though. The Anime hair she did has no movement morphs from what I can see, I may be wrong though. well i imagine it works like fibermesh then when you use the export as .obj option. i.e. you can tun that .obj into a figure using the daz tools that will conform to & follow whatever you fit it to. ofcourse if you do that with a full length hair prop get ready for the resource requirement to go waaaay up! would probably be nice for smaller figures like chest hair though. Came across the videos on youtube the other day ... me too! I am interested in this very kool looking plugin. Actually it's a good thing. Fiber mesh is basically just mesh, and it's relatively heavy on the resources. These curve based hairs are much more efficient, which allows for higher densities with thinner hair and thus better looking hair and fur. I'm sure you have noticed that most fiber mesh products tend to look too thick and sparse because the hair counts need to be kept relatively low. Two well made points. I'm still a fan of this and MUST have it. And the Fact all I need to do is update for each pose works just fine for my plans. I'm wishing to do many FURS in one render. Well many Furs in Many Renders but I see it will still work perfectly for my needs. And The Mec4D stuff was what I was thinking of. Oh my! Yes it does. I so hope that when the plug in is ready that I can get results this good. I am going to practice, practice, practice. Your horse is very touchable. I just bought mil horse2 so I will be ready! OMG I just saw the ape video of this plugin. I MUST HAVE IT!! It looks so FUN to use. The Garibaldi plugin freezes my system rendering just a 1cm2 preview hair patch. i hope LAMH will do fine on my i7 with a quadro1800 card. Just installed my 4.5pro. I want to apply for beta but can't find the link. He closed beta applications months ago. It's nearing final at this point. Sorry for not showing up earlier. I'm not getting any notification about new messages, so I'll have to remember to check here often. To clarify how things work, if you plan to export to .obj (which is plain mesh) you'll have to export those just when you have the model posed as you like. So, say you have styled the hair, then you feel like you want to pose the model in Studio to fit your needs; what you need to do is just resync LAMH to current model pose (just hitting a button), and if you like you can export the hair to .obj. Using RenderMan nodes that's different and more automated: you don't need to reexport from LAMH: instead, just posing/shaping/transforming the model in Studio will cause the RenderMan object to be automatically updated in the Studio viewport, so that you don't have to resync information all the time. How beautiful Faewolf, thanks for sharing. Was it particularly difficult to do that model? Just a quick update: to answer the many emails I received in the past weeks (well... months), yes I absolutely want to have Look at my Hair ready in time for XMas. There are still known glitches and limitations, none of which, believe me, will prevent to have a lot of fun and great time with it. My idea is to finish a set of hair styles for most common figures (which will come for free with Look at my Hair), finish preparing the manual and the tutorial videos and have it ready within the next three weeks. Once released, I'm planning on enhancing Look at my Hair even further providing updates possibly on a weekly basis. (on a side note, the same will apply to INFINITO as well, whose development is leading towards version 2.0). Also, given the hard economic times, which I believe are affecting each of us, no matter what part of the globe we live in, I believe you will all be very satisfied with Look at my Hair price (which I'll unveil only at the very last moment). You the hair Man AA!! Still waiting and so looking forward to the release!! You makeing sure to take care of yourself too I hope?? I am more than happy to hear all that has been posted. Is my advanced order ready yet? PS I hope you know I'm kidding!! !